“The improvement continues: The Gross brothers Chaim Michael Shlomo ben Michal and Rafael Yitzchak Isaac ben Michal who have been hospitalized for around 10 days at the Schneider Children’s Hospital in Petach Tikva, met for the first time this past Shabbat. Last week, one after the other, the brothers were disconnected from the ECMO machines that were substituting heart and lung activity. And one after another they were disconnected from their medical ventilators after they began communicating with their environment. [After they awoke, both brothers requested toys and candy and when he returned to consciousness on Thursday 7-year-old Michael remembered what the weekly Torah portion was going to be the Shabbat after the poisoning). Over the course of this past Shabbat, the two brothers were transferred to a shared room in the hospital’s ICU. This was the first time they had met since the terrible tragedy that took place on Wednesday around two weeks ago, in which the family members were poisoned, and 1 and 3 year-old sisters Yael and Avigail died while the Gross brothers were hospitalized in extremely critical condition. With G-d’s help [and to the shock of the medical staff] they have slowly returned to life. The younger brother, Yitzchak, has already started asking about his sisters, and parents, Shimon and Michal, are gradually telling him, as hard as it is, about the terrible tragedy that has taken place. Older brother, Michael, has not yet brought up the subject. Later this week, the medical staff will discuss the possibility that at least one brother will be released from the hospital. During a visit with schoolchildren in the Gross family’s Givat Mordechai neighborhood this past Thursday, Chief Rabbi David Lau told about his visit with the Gross family earlier that day in the Schneider ICU: “I met strong parents who know that the entire Jewish people is praying for their children…What has given them strength is the power of prayer.” He went on to explain that it’s clear that it doesn’t matter what kippah a person wears—what color it is and what material it’s made of—we are all children of one G-d who treasures all of our prayers. 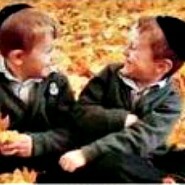 Please continue praying for a continued and complete recovery for Chaim Michael Shlomo ben Michal and Rafael Yitzchak Isaac ben Michal. Pesach Energy-Sapper of the Day: "If I Felt More Grateful I Wouldn't be Overwhelmed"
This is simply awe inspiring and heavenly and there are not adequate words to express the miraculous nature of this recovery and the boys pure, holy actions.